To make the crust: In the bowl of a food processor, combine the flour, salt and sugar. Place the bowl in the freezer for at least 20 minutes (or up to 24 hours). Cut the butter into 1-inch cubes and refrigerate until ready to use. Beat the eggs with 3 tablespoons of ice-cold water and put in the fridge until ready to use. Attach the bowl to the food processor. Add the butter and pulse until the mixture looks like coarse meal with a few marble-sized pieces of butter throughout (you can also do this by hand with a pastry cutter). Add the egg mixture and pulse a few times. If the dough seems dry, add more ice-cold water, a tablespoonful at a time, until it comes together. Turn the dough out onto a clean work surface. Gather into a ball, divide in half and press each into a disk. Wrap in plastic and refrigerate for at least 20 minutes (and up to 24 hours). To make the filling: Peel the peaches (a serrated peeler works best) and cut them into a very small dice. Place in a medium bowl and toss with the sugar. Transfer peaches to a colander or strainer and set over a bowl to catch the juices. Let sit for at least an hour. Transfer the drained liquid to a small saucepan and simmer over medium heat until reduced to a sticky syrup. Allow to cool. Transfer the peaches to a bowl. Add the cooled syrup, lemon juice, salt, almond extract and tapioca. Toss well to combine. Allow mixture to rest for about 15 minutes while the tapioca begins to absorb the liquid. To make the sauce: Meanwhile, remove the cardamom seeds from the pods and crush them in a mortar and pestle or with the bottom of a cup. Place in a medium bowl, along with the yogurt, powdered sugar, salt, saffron and vanilla. Mix well and refrigerate until ready to use. To assemble and bake: Line two sheet pans with parchment paper. Remove one disk of dough from the refrigerator a few minutes before using. On a lightly floured surface with a lightly floured rolling pin, roll out the dough until it's 1/4 -inch thick. Using a 3-inch cutter, cut out 6 to 8 rounds of dough. Arrange on a sheet pan and refrigerate while you repeat the process with the second disk of dough. Bake for about 35 minutes, until golden brown, turning the sheet pan from front to back halfway through. Let cool to room temperature and serve with yogurt sauce for dipping. Posted on January 6, 2015 by Oregon Coast Wasabi and filed under DESSERTS. Makes 6 to 8 servings Wasabi leaves aren't easy to come by, but if you can find them they are well worth it for this bright, spicy pesto. (Flying Fish Co. in Southeast Portland usually carries leaves as well as roots from Frog Eyes Wasabi.) If wasabi leaves are unavailable, mustard greens make a good substitute. For an even richer flavor, make the rice with stock instead of water. To make the rice: Soak the jasmine rice in cold water for at least 10 minutes. When it is slightly plumped and opaque, transfer to a colander or strainer and rinse under cold water until the liquid runs clear. Put the rice in a medium saucepan, along with 4 cups water. Set over medium-­‐high heat and bring to a boil. Reduce heat to a simmer, cover and cook for about 14 minutes, until all the liquid is absorbed. Remove from heat and cool to room temperature. Posted on January 5, 2015 by Oregon Coast Wasabi and filed under SIDE DISHES. Frying the wasabi together with potatoes gives these chips a subtle and pungent heat that is addictive and hard to place. For a cheater's version, buy good quality potato chips and only fry the wasabi. Toss them together before serving. You can make these in the morning and they'll stay crisp all day. Using a mandoline or a sharp knife, cut the potatoes and wasabi into 1/8 -inch thick disks. Fill a heavy-bottomed pot with 3 inches of oil and place over medium-high heat. When a deep-fry thermometer registers 375 degrees, add a handful of potatoes and wasabi. Fry until golden, turning and flipping regularly to encourage even cooking. Using a slotted spoon or spider, transfer the chips to a brown paper bag to drain. Sprinkle with a generous handful of salt, and pepper if desired. Posted on January 5, 2015 by Oregon Coast Wasabi and filed under APPETIZERS. This roast can be made either with bone-­‐in or boneless chuck roast. The bone lends richness and flavor, but both will generally be the same. If you get bone-­‐in, use the larger roast size. Fresh wasabi loses its vibrant heat pretty quickly after being grated. For best results, grate the wasabi right before serving. Posted on January 5, 2015 by Oregon Coast Wasabi and filed under MAIN DISHES. 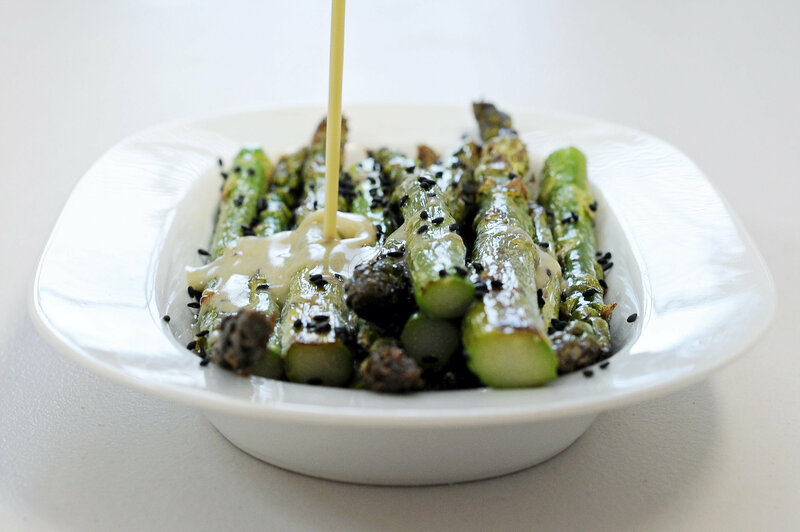 These vinaigrettes are delicious on greens or drizzled over steamed vegetables, such as asparagus. Add grated fresh wasabi to your favorite vinaigrette (1 teaspoon per cup vinaigrette). Or make one by whisking 2 parts vinegar and/or citrus juice with 3 parts oil and adding grated wasabi to taste. Whisk together 3 teaspoons grated fresh wasabi, 6 teaspoons soy sauce, 1/3 cup rice vinegar, 3/4 cup olive oil. Makes about 1 1/4 cups. Posted on January 5, 2015 by Oregon Coast Wasabi and filed under CONDIMENTS. Puree all the ingredients together in a food processor until smooth. You can adjust the thickness of the dipping sauce to meet your needs. This is a great all purpose wasabi condiment. The flavors of wasabi are preserved in fat, so it lasts a little longer, and you can put it on anything from hamburgers to potato salad, seafood salads, chicken salad, it goes with everything. Whisk the egg yolk and Dijon mustard together in a stainless steel bowl. Begin to slowly add the canola oil in a steady stream into the egg yolk while you whisk. Once you begin to emulsify the oil into the yolk, add half of the vinegar, and continue whisking in the remaining oil. Then stir in the other flavorings. This is a simple and fairly common salt pickle in Japan, where the leaves and stems are more readily available. They are quick and easy to prepare, and can be added to other dishes like cooked rice, marinated cucumbers or seafood, such as tuna poke or salmon. Bruise the wasabi leaves by crunching them into a ball in the palms of your hand. Then lay them in a stainless steel bowl and sprinkle with the salt and sugar. You can also do this in a zip lock bag if you prefer. Allow the leaves to macerate with the salt and sugar for about 45 minutes. They will begin to soften and purge excess water. Rinse off the leaves and chop them fairly fine, since the leaves are somewhat fibrous and this will make them easier to eat. Bring the potatoes to boil in a large covered pot of cold salted water. Lower the heat and boil until tender when pierced with a fork, about 12 to 20 minutes. While the potatoes are cooking, in a small saucepan, melt the butter in the milk (use moderately low heat). After the wasabi has stood for 5 minutes after grating, stir it into the butter and milk mixture. Once the potatoes are cooked, drain them in a colander. Return them immediately to the hot pot and shake them over high heat for about 30 seconds to dry them out. Peel and mash the potatoes (a ricer is the most efficient way, or use an electric mixer, taking care not to over-blend) and stir in the wasabi cream, salt and pepper. Note: You can leave the potato peel on for a rustic presentation. Lightly season flank steak with salt and togarashi, sear on high heat on all sides (approx 20 secs per side). Submerge in ice water for 1 minute, pat dry with towel. Smash avocado with mortar and pestle, fold in juice of half lime, scallion, wasabi and salt to taste. Make this slurry of rice flour and water, dip nori sheet in slurry and fry for 2 minutes at 375 degrees. After cool down, pulse in food processor. Stir in 1/2 tsp lime zest and sesame seed.. Thinly slice steak, dress with sea salt and olive oil. Top with dollop of avocado mixture and sprinkle with nori crunch. In a stainless steel saucepot, bring the dashi to a simmer and dissolve the sugar in it. While it cools, juice the lime and grate the fresh wasabi paste. Mix the juice and wasabi together and stir into the cool dashi mixture and place in a flat piece of plasticware and store it in the freezer. Once the mixture is frozen, use a fork to scrape the ice into flakes of granita. Shuck the oysters and arrange them on a platter covered with ice cubes or rock salt and garnish with the granita. The sharp yet cool granita blends into the briny, bright oyster. For an extra element of color and texture, garnish with trout roe as well. These are two wasabi sauces that go well with steak. The butter would be served on top of the steak, while the leaf sauce would be a plate sauce with the steak on top. Season the ribeye with salt and pepper and grill to your preference. Meanwhile, grate the fresh wasabi and place it into a small bowl with tempered butter, warm but not melting. Add the salt, and start to work them together into a smooth paste, then shape the butter back into a cylinder. You can roll the butter back up in the waxed paper it came in. Place it in the fridge to chill and firm up slightly. Then cut slices of the butter and place them on the steaks when they come off the grill. Bring a large pot of salted water to a boil. Plunge the cleaned spinach and wasabi leaves into the water. Once it is tender, remove and plunge into ice water to stop the cooking. Drain thoroughly and then weigh the greens. Rough chop them and place them in a blender with the dashi. Puree until smooth, which will take longer than you might think, a full 3 to 4 minutes. Then, while the blender is still spinning, add the xanthan gum, a common cornstarch which thickens without heating (It is now a common item used to stabilize vinaigrettes and used in gluten free baking. You can find it on the shelf of most grocery stores). The puree will look much smoother after adding the xanthan gum. The puree will benefit from passing through a fine mesh strainer to remove excess fiber. Posted on January 5, 2015 by Eva Goicochea and filed under MAIN DISHES.